As part of the Eating Disorder Awareness Week Feb. 4-8, Hopewell Support Centre came to the college to talk about the stigma and the story behind the organization. 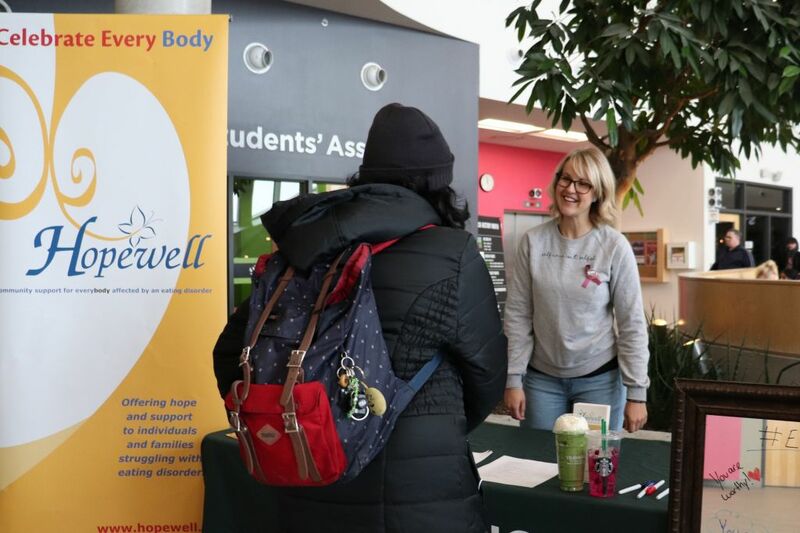 The Hopewell booth that was set up in the Student Commons on Feb. 6 presented information about various eating disorders and support for those who sought assistance. As well, the booth included a mirror where students could write a positive message about body image. Students could also see that inspirational messages to lift their spirits were written in some of the women’s washrooms. Hopewell program coordinator Christine McPhail said the biggest message that she wanted students and faculty to know during the presentation was that the stigma still exists and should be taken seriously, especially within our current culture. “Eating disorders are a mental illness and they’re not a choice. They’re not dieting gone too far,” said McPhail. The presentation went more in depth about the statistics and facts around disordered eating. Warning signs McPhail mentioned include: if a person is constantly weighing themselves, skipping meals or binge eating, dramatic weight loss/gains and has sensitivity towards their appearance. She wanted to promote prevention by helping people understand and end the stigma to the students in the AC Hub. “You can’t fix a person of their problems,” McPhail stated towards the end of the presentation. Hopewell is a support centre for those who either suffered through a disorder, or know a family member or friend who was affected. The non-profit organization was established in 1999 by three mothers who wanted to help their daughters overcome their battles. The centre offers support groups, programs, workshops, and other resources that can guide someone. However, the volunteers do not provide professional treatment. Eating Disorder Awareness Week sparks conversation Reviewed by Mae Estravo on February 8, 2019 .